Are you considering a walk-in tub installation? 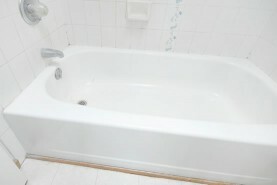 Before shelling out the cash for an expensive walk-in tub, you should know that installation requires tearing out your old bathtub. It may also require the removal of walls, modifying flooring, extensive plumbing modifications and days, if not weeks, of work. Miracle Method has a faster, more affordable alternative. In fact, the Easy Step® is just as effective in reducing the danger of slip and fall accidents, while also increasing access to bathing for injured or elderly people. Miracle Method's Easy Step conversion lowers the tub side to make getting in and out of the tub safer. During the process, we’ll create a 24-inch wide by 9-inch tall cutout in the side of your existing tub. Then the Easy Step can be installed in your tub in as little as one day. Which means if you’re coming home from the hospital, you won’t have to wait long to have an accessible, walk-in tub. Additionally, the process is reversible if the cut out is saved. We can replace it and restore your bathtub — which makes this a great option for people who eventually plan to sell the house. 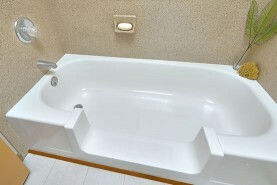 We’ll do the walk-in tub conversion on porcelain, steel, fiberglass acrylic, cast iron, and cultured marble bathtubs. Reduce the risk of slip and fall accidents with the Easy Step! When it comes to costs, the choice is clear: The Easy Step conversion typcially costs less than $1,000 compared to more than $7,000 for a walk-in tub installation. We can also provide a complete Bathroom Safety Package, which can be installed in just one day. In addition to the Easy Step conversion, we will install two ADA compliant safety grab bars, apply a slip resistant surface to the bottom of the tub, and install a hand-held shower head. We know that slip and fall accidents in the bathtub contribute to nearly 25% of hospital admissions for people age 65 and older, and we want to help you make your bathroom as safe as possible. To learn more about the Easy Step walk-in tub, call our toll free locator number at 1-888-271-7690 or click on Find a Location.